Many indicators show that globally democracy has advanced over the past four decades. Women participate in politics more than in the past, almost all children start school. 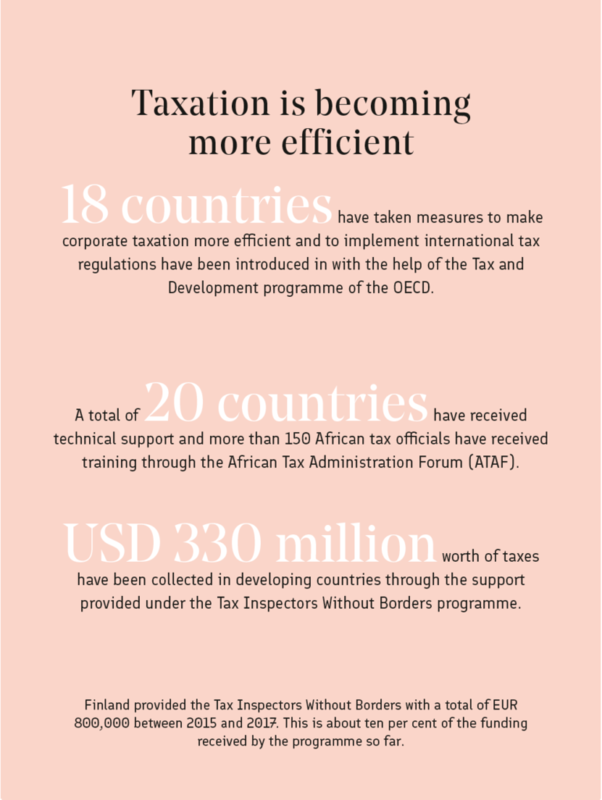 Public financial administration has developed and many developing countries are able to cover the public expenditure by taxes. 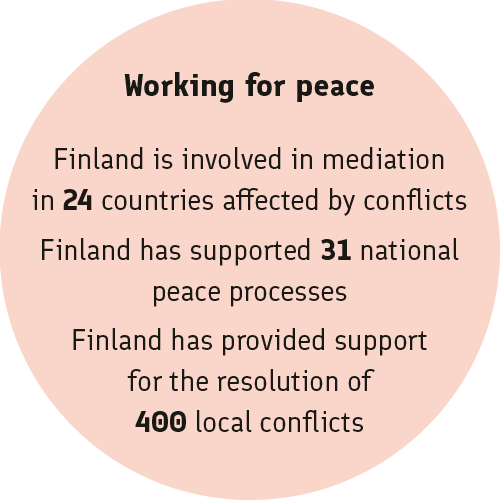 Finland’s support has contributed in peace-building, strengthened multiparty systems and just administration as well as people’s participation. Finland is a sought-after partner in the education sector. A long-term co-operation has brought results. one of the issues promoted by Finland. In Ethiopia, the inclusive education reform means changes in the curriculum of more than 30,000 schools. The positive trend in Ethiopia is also based on the work of a broad range of different organisations (incl. Finnish actors). The Abilis Foundation has provided politicians with training on disability issues, and taught women with disabilities to read and how to become entrepreneurs. As a result of the teacher training provided by FELM, hundreds of classes for deaf children have been established in rural areas. Deaf-blind people have gained access to vocational training through the efforts of the Threshold Association. Finland and FCA, access of children in a vulnerable position to pre-primary or primary education has been supported in 18 countries. The vulnerable position may result from disabilities, ethnic background, armed conflicts and/or natural disasters. In South Sudan, participation of women and their capacity to take part in political and peace mediation work has been promoted with the support of the Crisis Management Initiative, a Finnish conflict-resolution organisation, and Finn Church Aid. As a result of the work, women parliamentarians have engaged in mediation in eight regions by bringing messages of local women actors and activists to decision-makers. For the first time in many years, Boma State was free of violent conflicts in 2017. This was the result of a peace agreement achieved through the efforts of religious and traditional mediators. all participants have been women. On the courses, the participants have practised working in a multiparty system for the first time. For example, 90 per cent of the participants on the latest course said that they would engage in closer cooperation with other political parties and civil society after the training. companies) and the tax authorities. 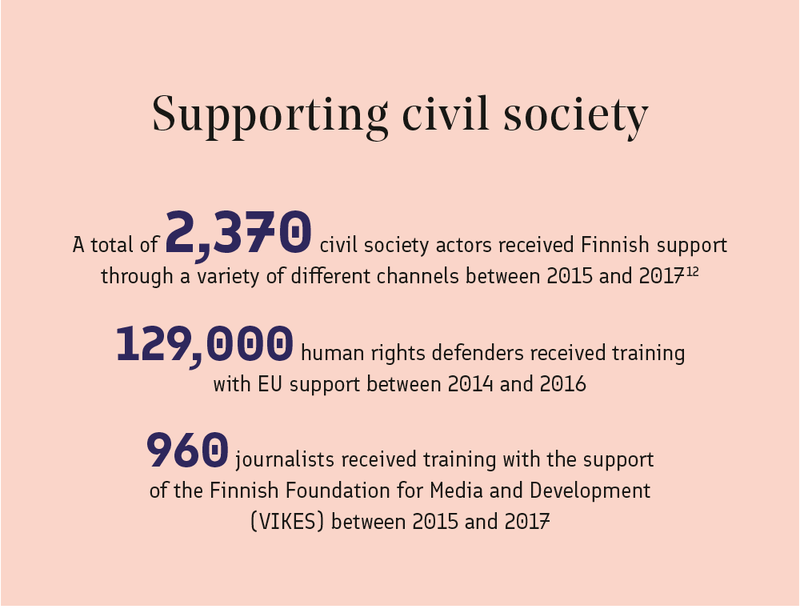 The work was initiated with Finland’s support by Oxfam, which considers the legislative reform as an important step in the right direction. The organisation continues its campaign to ensure that the reports are publicly available. This would allow civil society to supervise taxation. Oxfam plans to use the lessons learned from Vietnam inits other projects. People are more willing to pay taxes if the tax system is fair and transparent. In Vietnam, as much as 40 per cent of all education and health care provided by the public sector has been funded with fees paid by ordinary citizens and not from tax revenue. the 2030 Agenda for Sustainable Development. Well-functioning society-priority contributes especially to the goals number 16 and 17.